by Tarbuck, Edward J.; Lutgens, Frederick K.; Tasa, Dennis G.
For introductory courses in earth science. Mastering combines trusted author content with digital tools and a flexible platform to personalize the learning experience and improve results for each student.Built for, and directly tied to the text, Mastering Geology enables an extension of learning, allowing students a platform to practice, learn, and apply outside of the classroom. Note: You are purchasing a standalone book; Pearson eText and Mastering Geology do not come packaged with this content. Students, ask your instructor for the correct package ISBN and Course ID. Instructors, contact your Pearson representative for more information. 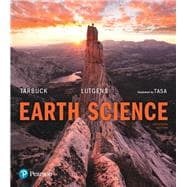 Lutgens and Tarbuck published their first college text, Earth Science, in 1976. That book, winner of the McGuffy Award from the Text and Academic Authors Association, is now going into its 15th edition. In 1983, as the 1st edition of Earth was being prepared, gifted geology illustrator Dennis Tasa joined the author team. Since then the three have collaborated on more than 20 projects. Not only do Tarbuck, Lutgens, and Tasa work well together creatively, they also enjoy spending time in the Sangre de Cristo Mountains near Tasa’s New Mexico studio.